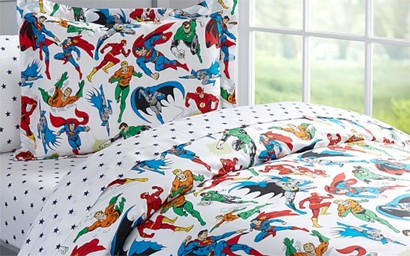 Check out this nifty kids duvet cover from Pottery Barn, featuring classic JLGL stock art of Aquaman, Batman, Flash, Green Lantern, and Superman! No Wonder Woman of course because girls have cooties! Awesome! Man, that would have went right with my son's decor when he was younger! Dagnabbit! I think I see some of the more recent Jerry Ordway "cal-lassic" style guide work there too. Particularly the Superman and Aquaman figures on the lower right. We got the pillow cases for our boys and I suggested to my wife that we get a sheet set for our bed. I said it would be nice to wake up and see Aquaman every morning but that didn't come out right. It just got more awkward from there.